To date, there have been 2,373 NASCAR Sprint Cup races contested since the series began competition on June 19, 1949 at Charlotte Speedway. However, NASCAR official records only recognize winners for 2,372 of those events. The lone Sprint Cup race without a NASCAR acknowledged winner is the 1971 Myers Brothers 250, held at Winston-Salem, North Carolina’s historic Bowman-Gray Stadium. Hueytown, Alabama’s Bobby Allison crossed the finish line first that day in his poppy red 1969 Ford Mustang. The controversy surrounding the official results of that race continues to this day. The 1971 NASCAR Sprint Cup season was quite different than the 1970 season due to the drastic reduction in sponsorship dollars received from the Detroit automakers. Starting fields were beginning to show the strain of reduced budgets as many events held at the series’ smaller tracks were contested with less than full fields. The Asheville 300 at Asheville NC, was ran with a 19 car field while the Space City 300 at Houston had a car count of only 14. To compound matters for NASCAR, its Grand American series was not only suffering car count wise but at the ticket office as well. The 1970 season featured 27 races on the schedule while the 1971 season included only 7 events. The Grand American series was in decline and needed a boost to survive. NASCAR made the decision midway through the 1971 season to run six combined Sprint Cup / Grand American races in an effort to bolster car counts and fan interest for both series. These events would be held at the remaining short tracks on the schedule with exception to Martinsville and Richmond. The promoters at those two tracks stated that they were opposed to the combination of the two series. The NASCAR-sanctioned tracks at Winston-Salem NC, Ona WV, Columbia SC, Hickory NC, Macon GA and North Wilkesboro NC were scheduled to host the combined Sprint Cup / Grand American events. The entry forms for these races stated that points would be awarded separately for each series. The Grand American series differed from the Sprint Cup series in that its competitors drove Camaros, Mustangs and Javelins rather than full-size Torinos, Cyclones, Chargers, Roadrunners and Chevelles. While the Grand American series cars had smaller engines which produced fewer horsepower, they also weighed less than their Sprint Cup counterparts and therefore had better handling on short tracks. 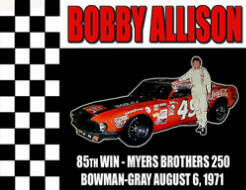 The first of these combined races, the Myers Brothers 250, was run on August 6, 1971 at Bowman-Gray Stadium, located near downtown Winston-Salem, North Carolina. Until 1967, the stadium had been home to the Demon Deacon’s football team from nearby Wake Forest University. In addition to the football field, the stadium also housed a ¼ mile asphalt track which had been active on the NASCAR Sprint Cup schedule since 1958. The track at Bowman-Gray differed from other tracks on the schedule in that its turns were flat rather than banked. This would give a distinct advantage to the better handling Grand American cars in an encounter with their Sprint Cup rivals. 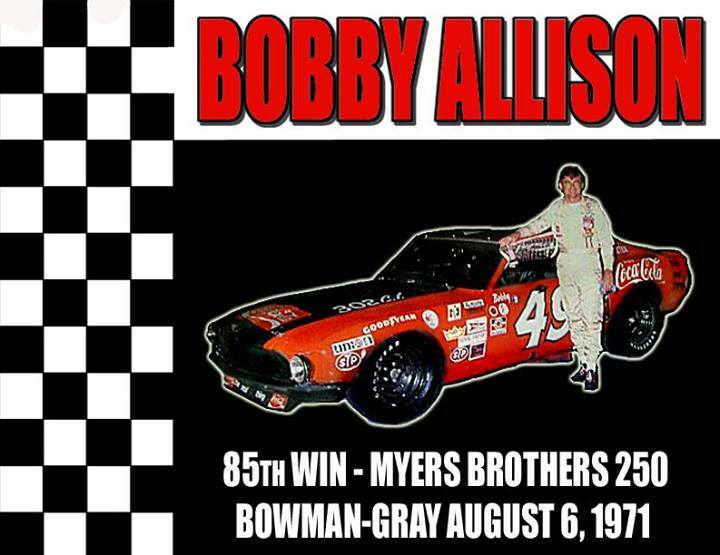 Since Grand American cars were legal for competition in the “Myers Brothers 250”, Bobby Allison made the decision to drive a Ford Mustang owned by Melvin Joseph. He made this choice because he believed the car would prove superior to the Chargers, Cyclones and Torinos that he normally piloted in Sprint Cup competition. An estimated crowd of 14,000 packed the stadium to witness Richard Petty dominate the early stages of the event in his factory-sponsored 1970 Plymouth Roadrunner. Petty broke the track record in qualifying but could not shake off Bobby Allison and his 1969 Ford Mustang during the race. On lap 113, Allison took the lead and held it to capture the “Myers Brothers 250” win and its $1,000 first prize. A few days after the race, NASCAR issued its official news bulletin race report which documented Allison as the winner of the event. In fact, eight of the top-ten positions in the “Myers Brothers 250” were Grand American entrants. However, NASCAR soon stripped Allison of the victory by declaring that he was not driving a Sprint Cup series legal car. This situation would repeat as Tiny Lund and his Ronnie Hopkins owned Chevrolet Camaro Grand American entry would capture the combined races at Hickory Speedway and North Wilkesboro, both located in North Carolina. As with the “Myers Brothers 250” victory, NASCAR did not acknowledge Lund’s two wins for the 1971 season. Lund’s family successfully waged a long campaign to have his victories restored and subsequently included in the NASCAR record book. Bobby Allison has also made repeated appeals to NASCAR for proper recognition of his “Myers Brothers 250” victory but so far has had no luck. Allison is currently recognized by NASCAR as having 84 official Sprint Cup victories rather than the actual total of 85. The 84 win total places him in a tie with Darrell Waltrip for fourth place in all-time wins behind Richard Petty (200), David Pearson (105) and Jeff Gordon (87). The NASCAR Grand American series was terminated after completion of the 1972 season. It contested its last event on August 6, 1972 at Talladega, Alabama. Tiny Lund won the 50 lap event in his 1972 Pontiac Firebird.